Though the seven states’ inhabitants are as Indian as the rest of the country’s denizens, unfortunately they’re still considered to be ‘different’ or ‘outsiders’, owing to their looks and language. So, Hazarika’s new tome on that region is a welcome read as it brings to us an insider’s view that’s as detailed and informed as it can get. Drawing from his own personal experiences and vast repertoire of resources, and travelling widely across state lines to hear the tales of the people from the people, the author presents a comprehensive showcase of his part of the country that’s replete with history and nature. What does it mean to be Indian? How do our country’s millennia-old history, religions, politics and socio-economic issues shape us? In her debut book, writer and businesswoman Chatterji pens essays on social evolution, nationalism, democracy, pluralistic faiths and more, to acquaint readers with what being part of India means to us. Full of vivid and engaging personal stories, including an eventful trip to Pakistan, the setting up of her non-profit organisation abroad, and her life as a middle-class child, Chatterji’s book may be a heavy subject, but makes for an intelligent read. For anyone interested in current affairs or even just to understand our place as the world’s largest democracy, this one’s a great pick. 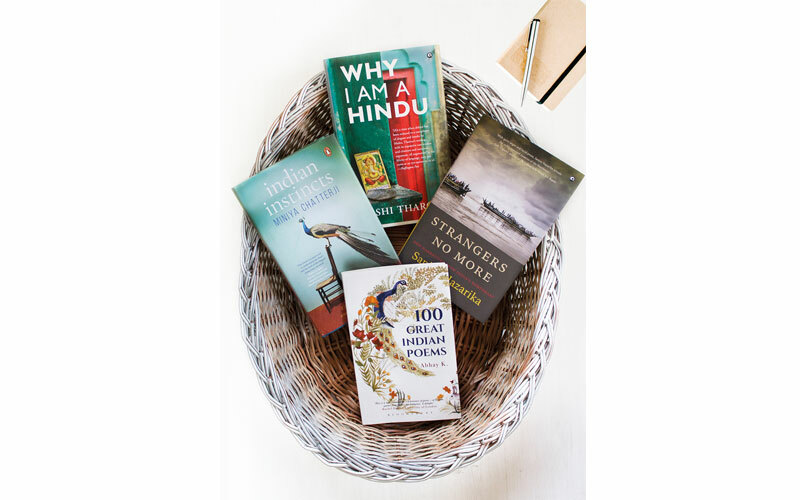 Verses from the Rig Veda greet you when you open the first page, and soon enough, you know that this 300-page tome from one of contemporary India’s leading minds will engross readers from the word go. Tharoor — known for his impeccable command of the English language as well as his stellar debating skills — in this book, presents a strong study of his faith, also one of the world’s oldest religions. Divided into sections on Hindu customs and philosophies, its place in politics and where it stands in modern Indian society today, this non-fiction read is a real eye-opener. A truly thought-provoking book, Why I Am A Hindu raises several pertinent questions about faith and religion, provides intelligent arguments and is sure to make the reader ponder over its content long after a read. ‘Poetry is language at its most powerful’ goes the saying, and rightly so. This collection of verses from some of our country’s best poets celebrates Indian heritage at its finest. From love and loss to social issues, mythology, religion and history, the poems in this anthology traverse varied themes, and each is more insightful than the last. Featuring works by medieval greats like Mir Taqi Mir — a pioneer of the Urdu language — and Lal Ded to our contemporary masters including Keki Daruwalla, Jayanta Mahapatra, Arvind Krishna Mehrotra and Eunice D’Souza among others, this book is a delight for lovers of verse, as well as a perfect pick for those who want an introduction to Indian poets and poetry. As Abhay K writes in the foreword, you’re sure to “enter a world of bliss” with this tome.